...that helps the development of a baby's brain. The idea that breastfeeding plays a role? Not according to the research evidence. See our piece in Bloomberg View that lays out the evidence that this is a myth. So what can you do? Talk, talk, talk to the baby. Needless to say, if you don't believe us, read the evidence! The essay contains links to literature. For additional direct access to key literature, browse these technical papers. The longest day of the year is a great time to remind parents - if you want to reduce the likelihood of nearsightedness in your child, outdoor time is ideal. We wrote about this last year in the New York Times. The tendency toward myopia is genetic, but actually becoming nearsighted depends on environmental factors. Turns out, it's not near work, such as reading at close distances. So...if he wants to read, let him do it outside! North Korea media called the South Korean president "an underwit with 2MB of memory." Now, is that nice? Several neuroscientists - including me - correct the record, as much as it can be corrected. The upper limit, 100 terabytes, is a bit silly - memory doesn't quite work that way - but it's catchy, isn't it! This weekend on Bloomberg EDU, Sandra and I talk with Jane Williams about how to make kids' brains strong. Tune in: Sirius XM Channel 113 or http://bloomberg.com/radio. Saturday 11am/8pm, and Sunday 12am/7pm, all Eastern Time. A new research study has come out showing that emigrating to another country during pregnancy nearly doubles the risk of having a child who has low-functioning autism. The article will be published soon in the British Journal of Psychiatry. 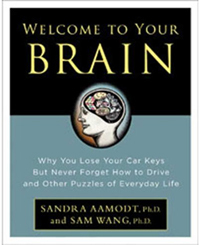 Sandra and I wrote about the possible reason why in Welcome To Your Child's Brain. A similar finding has been observed in women who flee a hurricane during late-second or third trimester - or are caught in an ice storm. In all cases the risk of autism is increased. What do these events have in common? The answer is that all are stressful events. Stress hormones, which organize the brain and body's response to an important event, can also impede brain development. The third trimester is known to be an especially important period for the development of hindbrain regions that are aberrant in the brains of autistic persons, such as the cerebellum. It's plausible that undue stress at this time might drive the normal developmental process off track. Here is yet another mention of the myth that there is an advantage to being the oldest kid in one's kindergarten class. Andrew Sullivan highlights a speculation by cartoonist Scott Adams...who quotes Outliers by Malcolm Gladwell, which pointed out that Canadian hockey stars tend to be the oldest in their kiddie camps. Gladwell's meme has spawned a popular belief that it is a good idea to hold a child back from entering in kindergarten. I'm not kidding about this! As our readers know, "academic redshirting" - the practice of purposely holding a child back from entering kindergarten - is done for 1 in 11 children. There is a belief that this somehow gives kids an advantage. I've noticed that the belief is especially prevalent among business types who think - wrongly - that they are doing their children a favor. However, as Sandra and I pointed out in the NY Times last year, this is exactly backwards. After reviewing the evidence in depth, all the scientific evidence (a link to the most reliable research we uncovered is here) argues in the other direction. In fact, the advantages goes to children who are young for their year. Ironically, Gladwell's original point doesn't even hold for all sports; for example, it isn't true for women's sports, noncontact sports, or even some contact sports. In short, if you are trying to raise the next Wayne Gretzky (and even then, only if you live in Canada, where small children are heavily coached), sure, hold your boy back. But if you want your child to achieve academically, become better-adjusted, and avoid delinquency - all signs point toward letting him or her advance. In short, think of redshirting as "Some Children Left Behind."